Italy is a country known for design. From the fashion runways to industrial design houses, it’s one of the leaders that forge ahead, setting trends and developing new styles. Since the days of Ancient Roman Art, the Italian aesthetic is one that has been infatuated with ornamentation and decoration. Following the often overly-ornate periods of Baroque and Rococo art, Italy’s focus on nature’s beauty led back to classically styled art and design that is elegant in its simplicity. The automotive embodiment of Italy’s rich artistic roots, are the polished lines that arc and curve over the beautiful red panels that make up Ferrari’s corral. 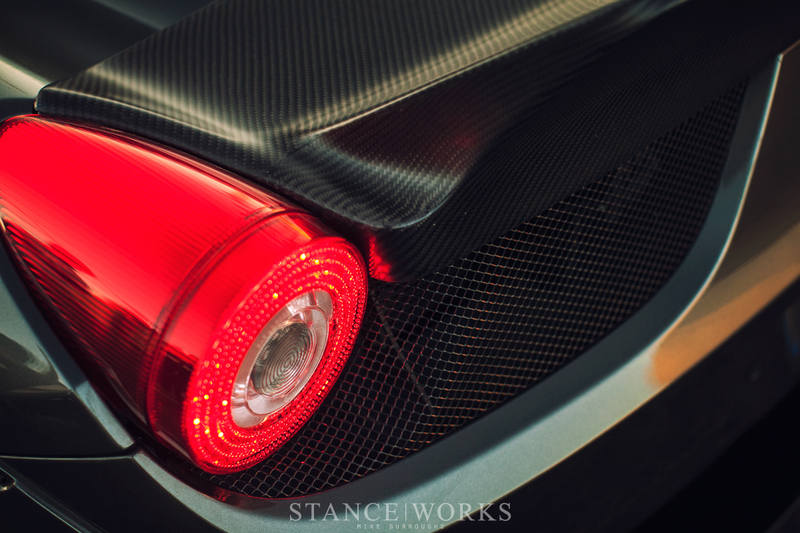 Ferrari’s cars have a certain elegance that blends the soft lines of beauty and form with the strong lines of a performance car; the bodywork carefully sculpted by famous coachbuilders such as Zagato, Bertone, and Pininfarina. The Ferrari’s lines flow over its figure, gently rounding over the flares that house the lightweight wheels and performance brakes. 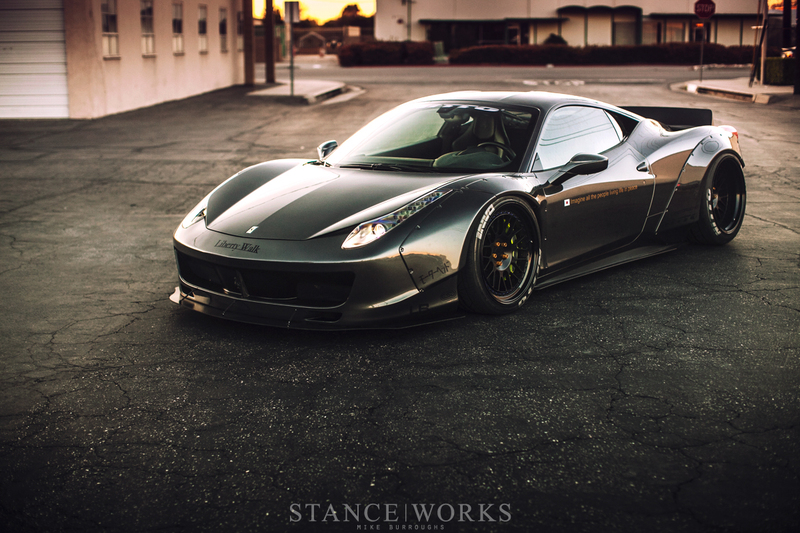 The low slung stance and wedge silhouette hint at the performance that lies beneath, but a Ferrari carries itself with a graceful demeanor fit for the fashion runway. 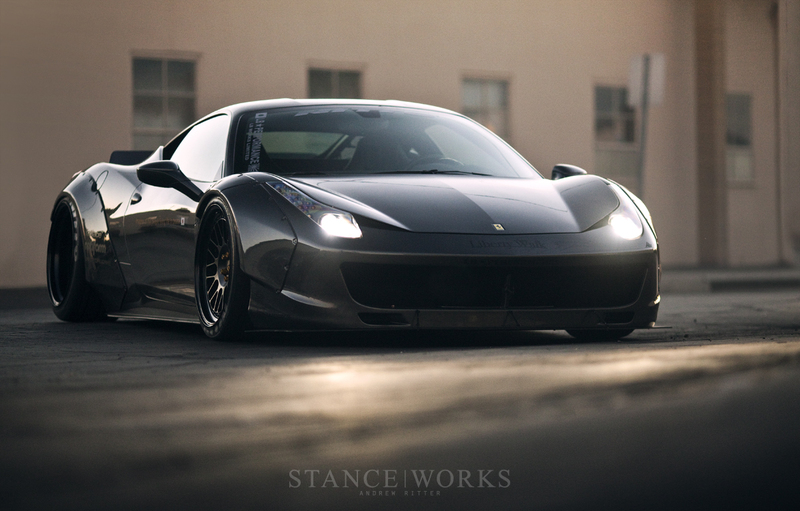 It’s a refined balance of form and function that can only come from the streets of Italy. Enter Liberty Walk, a Japanese tuning house recently gaining notoriety for their wild wide-body builds. Having already made a splash with their M3 and Lamborghini kits, they set their sights on a Ferrari 458. 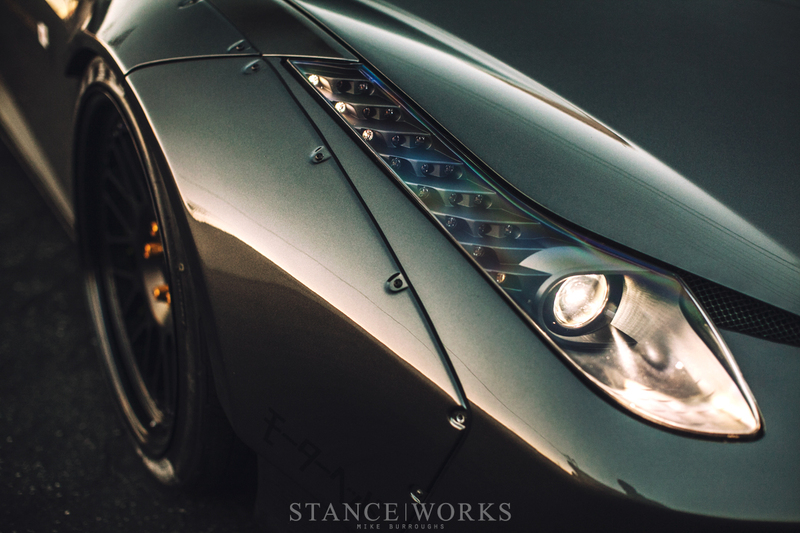 With a certain sense of irreverence, they have introduced extravagance to the elegant form of the Italian supercar. Widened fenders pull on the organic lines, giving strength to the already broad shoulders and hips of the Italia. The exposed hardware clashes with the previous refinement that once graced the car, introducing a menacing rawness to the car’s character. 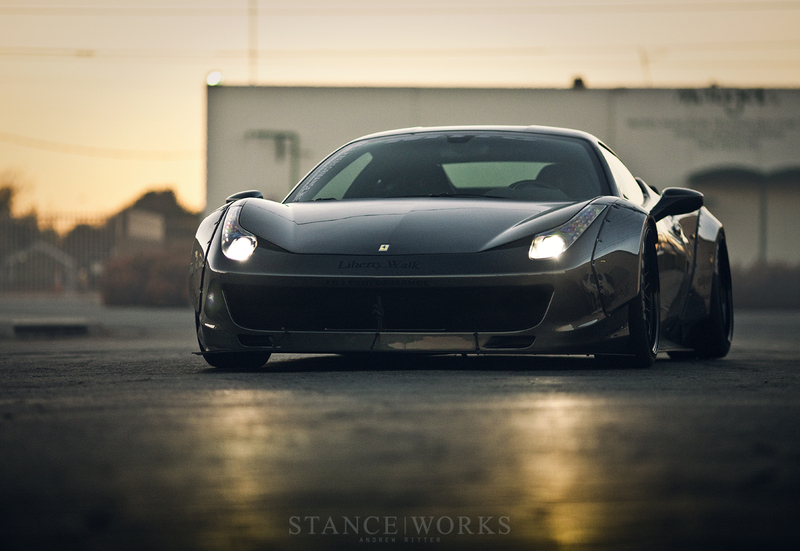 It was mere days before SEMA that the team at LTMW in El Monte, California, got their hands on the stock Ferrari. Under the same roof sat an F30, an E91, a Rocket Bunny FRS, another 458, and the first Liberty Walk GTR as well - all due for the same big weekend: the team had their work cut out for them. With care and precision, the fenders and quarter panels were cut away from the car, giving someone the chance to walk away from the build with unique experience of running a cutoff wheel through the skin of an F-Car. Panels were lined up, lines were drawn, and clearances were checked before a drill was taken to each corner of the car for the mounting tabs, throwing the car's rapidly diminishing resale value out the window with a beautiful sense of apathy. With the holes drilled, the panels were mounted, fitted, trued, and squared. 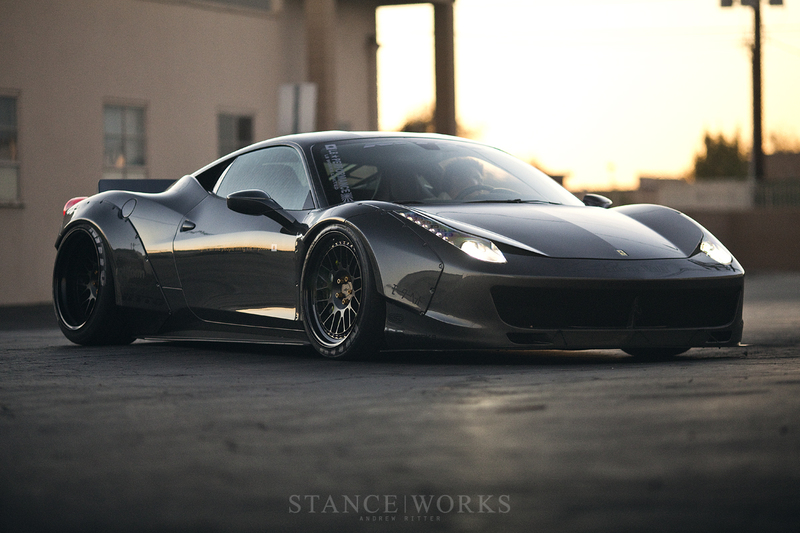 The kit's lines draw from the 458's flawlessly, bringing the car into a realm few to which Ferraris have ever ventured. 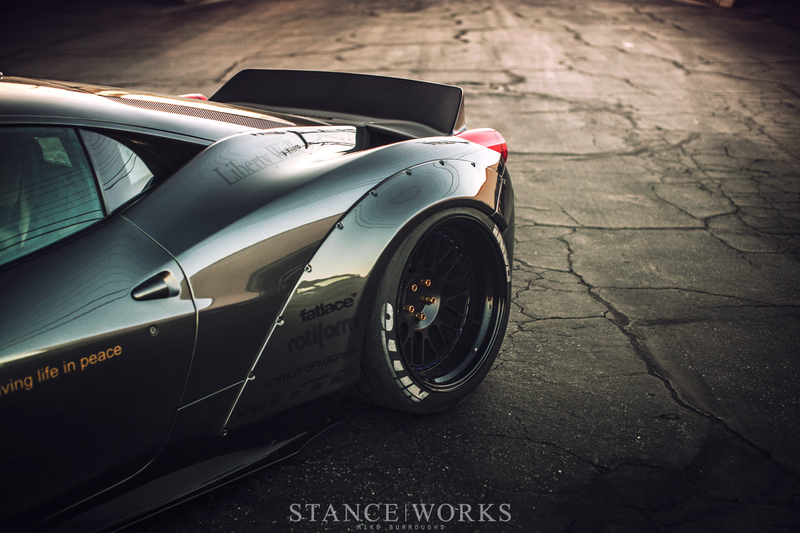 The Liberty Walk kit is a finely tailored suit, albeit one of an aggressive nature. The nose of the car has been sharpened and simplified - the factory organic splitter veins are gone in favor of a wider, gaping mouth. The lower edge is traced by an aggressive splitter, which is carried from the front down the sides of the car. 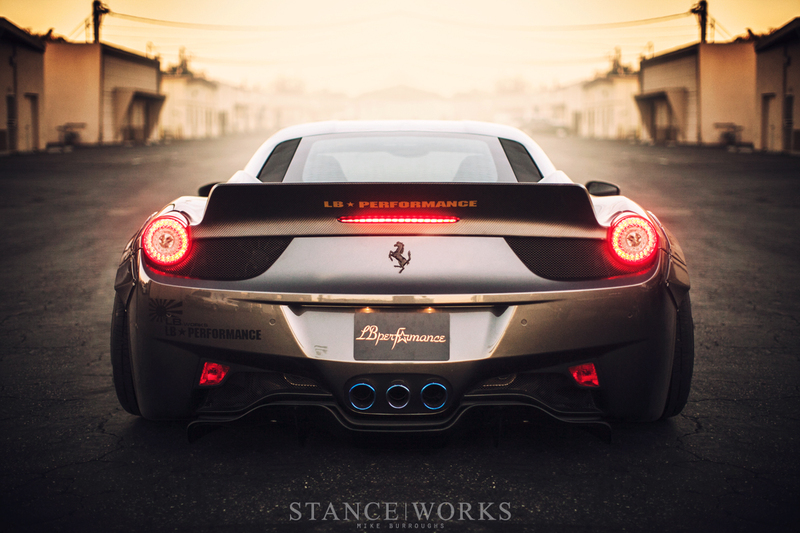 Under the tail end of the LB Performance 458 is a custom rear diffuser, which adds to the race-inspired aggression of the car. And lastly, to complete the tail end, a tall duckbill spoiler is perched atop the car's engine cover. 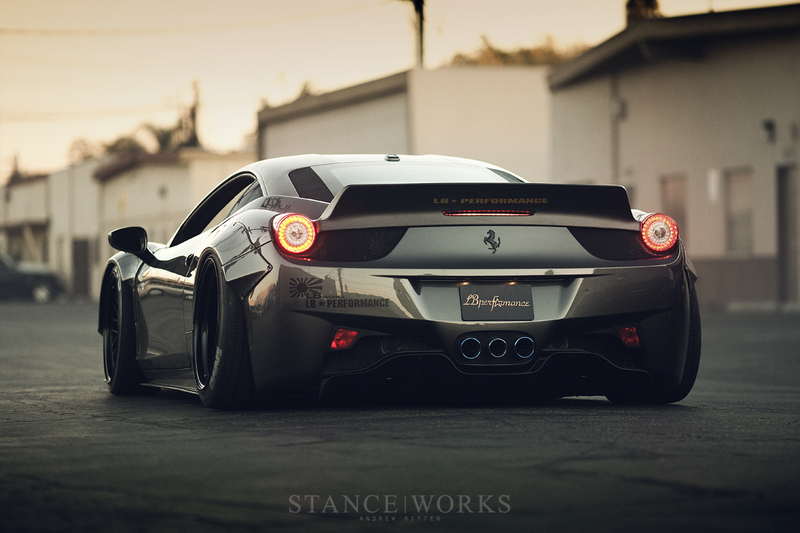 To drop the car, custom Liberty Walk springs were fitted to the factory Ferrari suspension. Under the widened arches is a set of Rotiform LVS wheels built specifically for the project, measuring out to 20x9 et0 in the front and 20x12 et-33 at the back end. Nitto INVOs wrap all four corners, with 245/30/20s resting under the front fenders, and 295/30/20 squeezed under the tail. 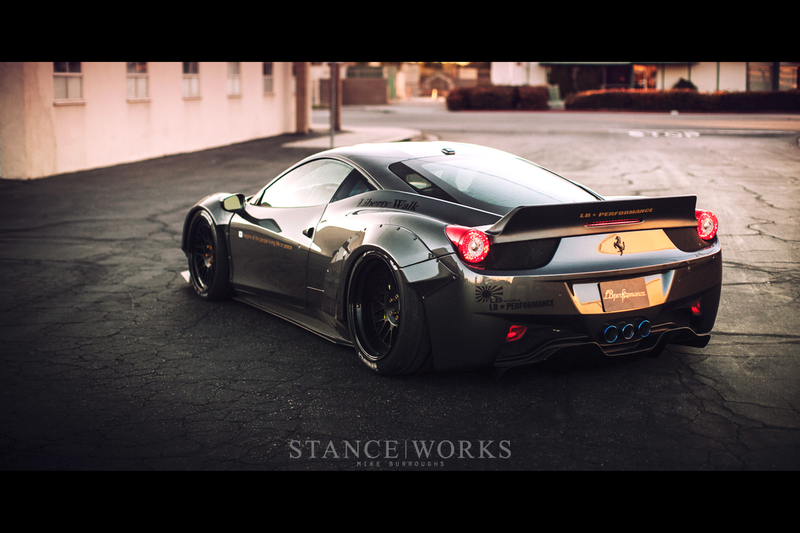 The car as a whole is a sight to behold, and for those attending the SEMA show, it's one you truly shouldn't miss. Perhaps cliche, but this is a car that looks fantastic in photos, but has an truly special presence in person. 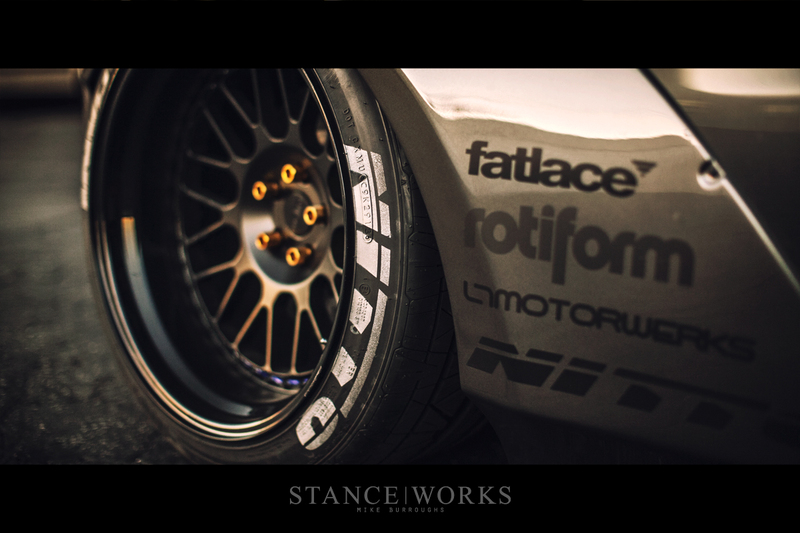 The Liberty Walk Ferrari 458 will be found in the Nitto Tire booth alongside some other impressive builds as Nitto continues to celebrate and support the enthusiast and stance community. Great pictures guys! What a car! Not that i don’t like it but i would like to see this car without the seems from the widebody kit, then it would be even cleaner then it is right now! 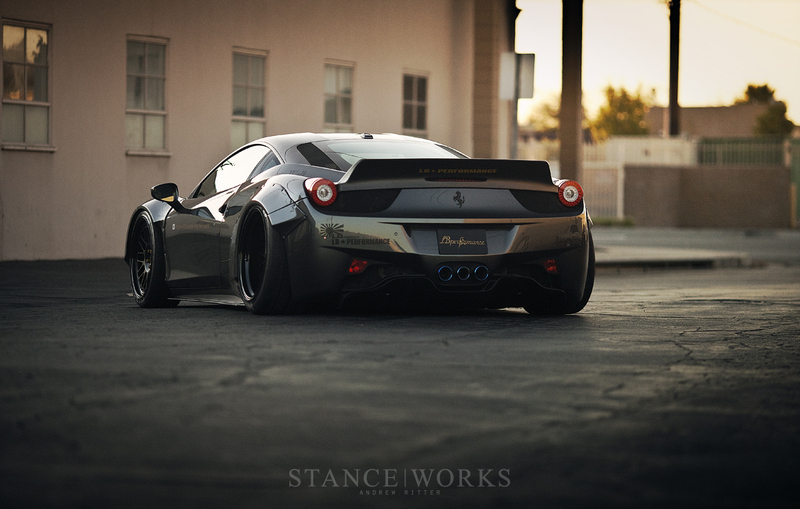 Is there a possibility to download those photos of 458 in 1920×1080 resolution? Pleeeeeeeeeeease get some hi res versions of these posted this thing is too insane to not be my wallpaper!!! 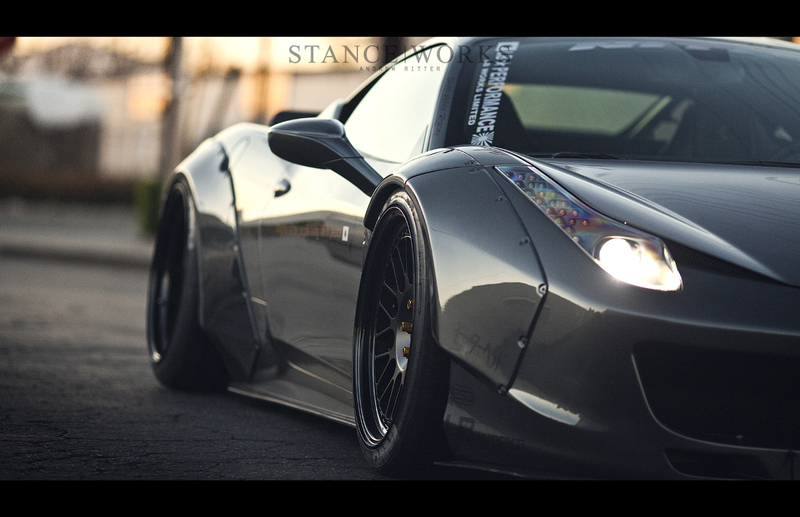 NEED HI-RES DESKTOPS ASAP 0.O amazing article and car. 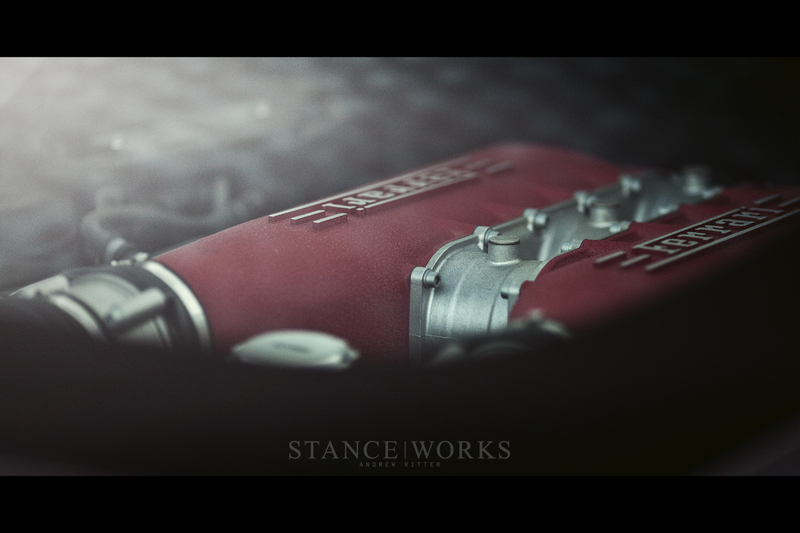 The guys at Liberty Works have turned what I saw as a boring and understated Ferrari, into an extraordinary work of automotive art and sculpture. They’re rendering here perhaps the most beautiful car I’ve ever seen, period. What would make this body kit even more perfect would be if the wide body panels were somehow integrated directly into the car’s original body panels without the attachment “rivets”. Now just imagine taking this work of automotive lust and add the Hennessey Twin Turbo performance kit, taking the 570 hp up to 730!